Can You Tell I Have Postpartum Depression Just By Looking At Me ? You’ve just had a baby. You expected to be basking in new mom bliss. You expected to be celebrating the arrival of your little one with your friends and family. But instead of celebrating, you feel like crying. You were prepared for joy and excitement, not exhaustion, anxiety, and weepiness. You may not have been expecting it, but mild depression or anxiety and mood swings are common in new mothers—so common, in fact, that it has its own name: the baby blues. The majority of women experience at least some symptoms of the baby blues immediately after childbirth. It is a feeling precipitated by the sudden change in hormones after delivery, stress, isolation, sleep deprivation, and fatigue. You might feel more tearful, overwhelmed, and emotionally fragile. Generally, this will start within the first couple of days after delivery, peak around one week, and taper off by the end of the second week postpartum. Unlike the baby blues, postpartum depression is a more serious problem—one that you shouldn’t ignore. However, it’s not always easy to distinguish between the two. In the beginning, postpartum depression can look like the normal baby blues. In fact, postpartum depression and the baby blues share many symptoms, including mood swings, crying jags, sadness, insomnia, and irritability. The difference is that with postpartum depression, the symptoms are more severe (such as suicidal thoughts or an inability to care for your newborn) and longer lasting. You might find your anxiety out of control, preventing you from sleeping –even when the baby is sleep, or eating appropriately. Daycare Vs. Nanny: Which Is Better For You? Your best friend may swear by nannies, while your sister believes that daycare is preparing her children for the Ivy League, but how do you choose which type of care is best for your family? Because your family is like no other, you need to make your choice based on your unique family’s needs, wants, budget, personality, lifestyle, and parenting philosophies. So what should you be considering? Group care and “schooling” at a young age can be an incredible and valuable experience for many children and families. 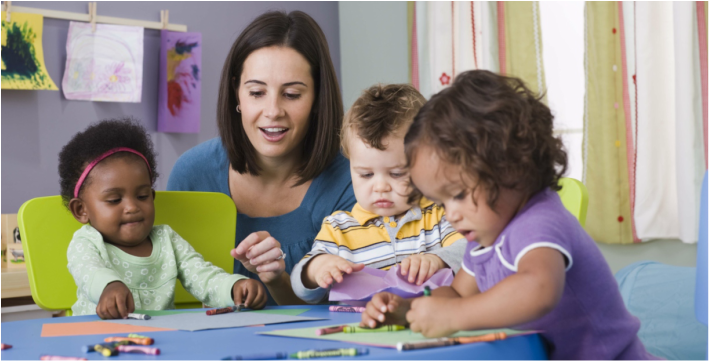 Daycares are often more affordable and boast quality care with structured classroom learning. They also provide the opportunity for socialization and experiences that are hard to recreate in a home environment with only one child. On the other hand, daycare can be a struggle for parents who are passionate about their child’s care being handled with a specific childrearing approach and on a schedule of their choosing. Also, some children may struggle with minimal one-on-one attention, over-stimulation, and health concerns in a daycare. One of the main advantages of a nanny is that she is able to focus her attention and affection solely on your child’s needs, while complying with your instructions and beliefs for education. A nanny can work on a schedule that best fits your life, and may assist in keeping your home environment in order, allowing you to spend your time on the things that matter most. But keep in mind that this situation is only as good as the nanny herself! Parents need to consider that it can be more expensive and complicated to have an in-home employee. Time and effort needs to be invested into the hiring and training process ensuring that you find the best fit caregiver and work is required throughout the period of employment for maintaining healthy communication. So, is daycare or a nanny better for your family? What type of environment and caregiver do you prefer for yourself and want for your baby? Calm, quiet and nurturing or active, fun and engaging? What is your communication, management and conflict resolution style? Are you organized and scheduled or do you have a naturally flexible attitude? Do you have strong emotions or beliefs related to certain parenting styles or educational and child raising philosophies? What are your views on immunizations, cleanliness, and germs? What are your concerns, both rational and emotional, related to childcare? After you have carefully assessed your family’s needs, research the childcare market in your area and interview both daycare and nannies. Talk to seasoned parents to understand the benefits, challenges, and feasibility of the different options and how they may or may not apply to your family. Find out the standard industry rates for nannies in your area, your legal obligations, best practices for interviewing and hiring, and the benefits that many quality nannies expect to determine what will fit your family’s budget. The bottom line is you may never truly “know” and even once you have a plan in place you may find yourself revisiting the decision. So after assessing your family and researching you options, follow your “mommy (or daddy) intuition”, knowing that there is no right or wrong but rather a choice to be made! It comes down to your family style.